Well, it's no Breitling, but I never thought I would miss a smart watch, I guess I found them intrusive (constantly telling me to breathe, or just move) and I never used my last one to its full potential, ever. Recently I have started taking more of an interest in my health, and more importantly how physical I am. I hear about all these bloggers achieving 10, 000 steps a day and it got me thinking; how much do I move in a day. Well, the short answer is not very much! What’s different about the GarminVivomove HR is that it’s not a ‘smart watch’ per se. It’s a watch first hand but with smart watch features. 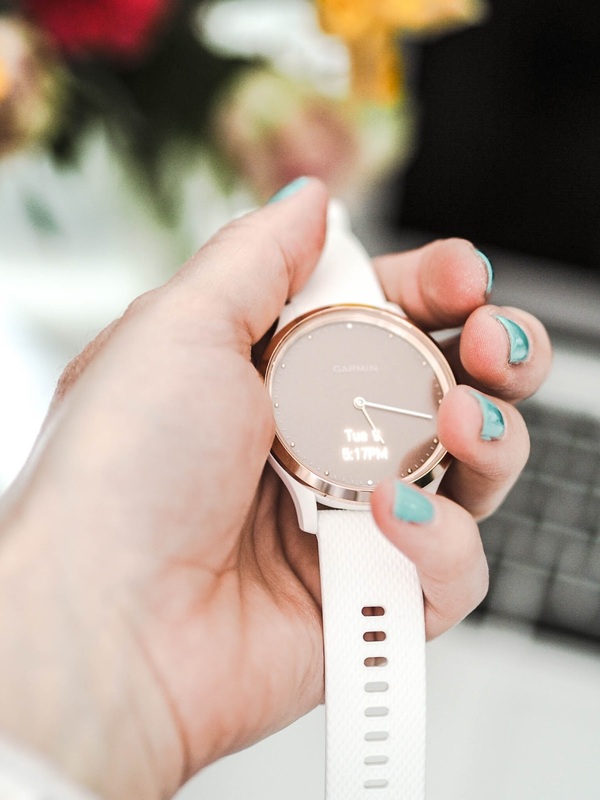 The screen itself isn’t obtrusive, but it still displays the date and digital time just on wrist movement alone. First impressions are good. 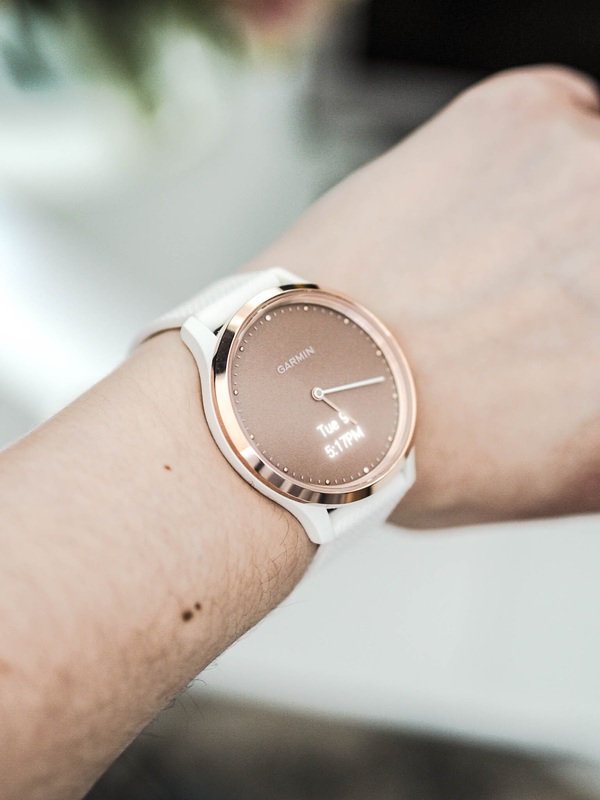 I love the big face, the rose gold and white is perfect for me. It is classy, pretty, but also sleek looking. It’s wearable during the day, and at night time too. I do worry about the strap getting dirty, but I believe the straps are interchangeable, so I will probably just buy another one. It doesn’t constantly ding or ring on every notification, it just vibrates which is more than enough for me. It also makes it work appropriate and more socially acceptable. 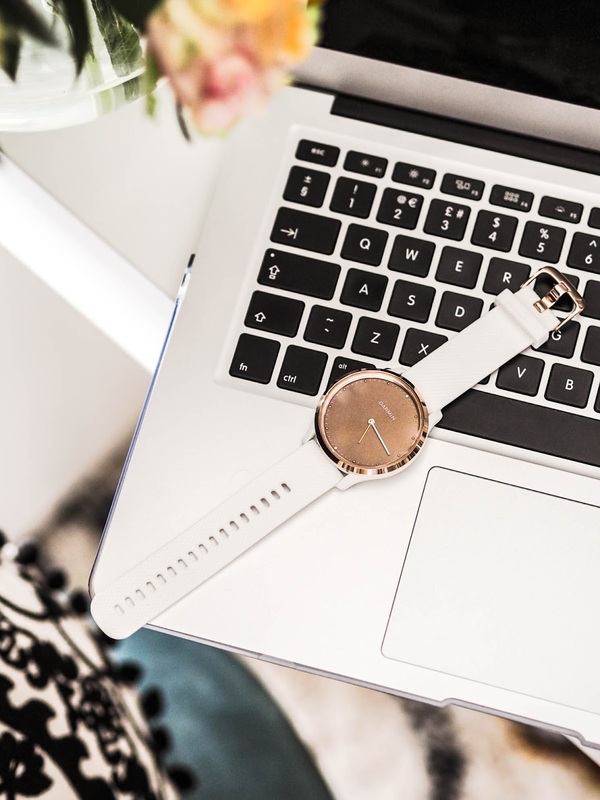 The main features I tend to use most frequently are the steps, notifications, music, my resting heart rate and the stress indicator, which I find quite useful! All of which are available on your watch screen with just a simple swipe across. There is no big menu to navigate or a million buttons to press. On setup it lets you set times for when you want your watch to ‘sleep’ which is great because my previous smart watch customisation was a lot more in depth, and had to be done on a more daily basis. I love how basic the watch is, I guess that's reflected in the price, but it still ticks all my boxes. The app is not difficult to use either, but I still have things I would like to explore when I really start to get back into my fitness. I have yet to set myself goals etc. Because I wanted to make sure that this was the gadget for me when it came to getting my fitness back on track. It is also waterproof, and the battery life is amazing. I first charged this on Friday and it is now Thursday and it still has half a battery life left with continuous use. The only downside is that the smart watch capabilities doesn’t work out of range to your phone. I know you can probably get this on a fancier version if you are willing to spend the dollar, but I’m certainly not!